In fact, you could enjoy the show not even knowing what basketball is. The electrifying athletes prance about the stage showing off their trick shots and incredible ball handling skills whilst creating a dramatic comedy show with plenty of audience interaction. The team have been at the height of family entertainment for the past 90 years selling tickets to toddlers, teens, parents and the elderly adrenaline junkies. They have played over 26,000 exhibition games and performed in 122 countries. Although it is a male dominated sport, the Harlem Globetrotters' team includes two talented female basketball players, TNT Lister and Ace Jackson. The girls each bring different skills to the show whilst representing female athletes around the world. The team recently launched the Great Assist initiative alongside American TV Broadcaster Robin Roberts, who the Globetrotters also named their tenth Honorary Harlem Globetrotter (joining Nelson Mandela, Pope Francis and more). The initiative pledges to spread 100 million smiles over the next ten years with smiles, sportsmanship and service. The team will visit children's hospitals, help build homes for the vulnerable and spread anti-bullying messages to schools in North America, and they urge all their fans to get involved, too. 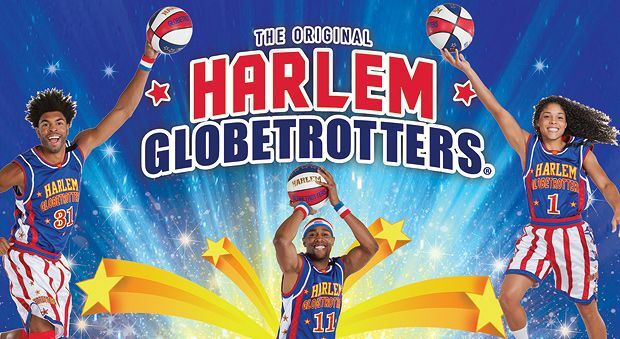 The team have promised to sign autographs and take photos with fans once the show is over, and why wouldn't you want a selfie with a sweaty Globetrotter after an intense and high paced basketball show? Tickets on sale Fri 23 Sep, 9am.